We visually profile the technology and company in our Multi-Slide Guide here. 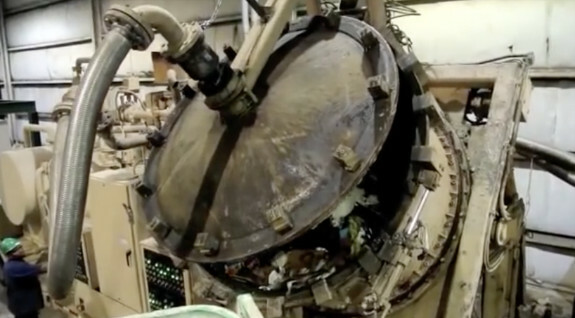 The underlying facility is what’s known as a Dirty MRF, or materials recovery facility. That’s where the receiving happens and the sortation begins — and the process of recovering value back from the waste stream begins. The bottom line data point for this project — indeed, any project utilizing municipal solid waste as a feedstock for advanced fuels, chemicals or materials — is that the old model of sorting waste into metals, plastics and organics and then combusting organics into electricity is broken. Technically it works, but it can’t make money, and communities face choices between more landfills, long-term subsidies to support waste-to-electrons financial losses, or utilizing advanced technology to extract more value. The key opportunity in MSW is that 50 percent of MSW is the organic fraction — and Fiberight has found a financial model that works in upgrading this waste stream into biogas, which can be utilized in the higher-value CNG market among other places. As a renewable transport fuel based on cellulosic material, it also qualifies for valuable cellulosic RIN credits. MSW arrives at the Materials Recovery Facility. The technology combination appeared in 2013 after Fiberight worked for almost six years on waste-to-ethanol projects, but found ultimately that the value-to-risk ratio was better for prospective investors in CNG as opposed to ethanol. E10- ethanol market saturation and the resultant price competition amongst producers has been the important ‘risk appetite differentiator” for investors between ethanol and CNG. Over in Edmonton, Alberta, Enerkem is operating an MSW-to-ethanol facility, and we expect to see many more projects from that company, but Enerkem has been very much the exception in getting projects financed using MSW to create high-value fuels and materials. Fulcrum BioEnergy switched from ethanol to highly-prized jet and diesel some time ago and, with the steadfast support of pioneering airlines such as United and Cathay Pacific, put its financing together not long ago. But other companies like TMO Renewables and Terrabon (now Earth Energy Renewables) have not been able to make the leap to commercial-scale. The proposed processing facility will consist of a 144,000 square foot building that will provide for the receiving, storage and handling of MSW for processing and/or converting into recyclables, renewable fuels and residues for potential recycling and/or disposal off- site. The proposed processing building will contain a tipping floor designed to accommodate up to 2 days of inside storage capacity for raw MSW and 2 days of inside storage capacity for first cut material from which unsuitable waste such as textiles and large bulky items have been removed. A second sort system will separate curbside-type recyclables from food waste and other soluble organics in the waste stream. The MRC and Fiberight state that the food wastes and other soluble organics will be converted to sugars and initially converted to bio-methane, via an anaerobic digester, which is proposed to be piped into an existing natural gas pipeline owned by Bangor Natural Gas located adjacent to the project site. In the future, the sugars may be sold directly as industrial sugars subject to prevailing market conditions. Fiberight anticipates between 70 percent and 80% by weight of all incoming MSW will be converted to renewable fuels or recycled, and the remaining 20% to 30% by weight will be process residues to be disposed off-site. In addition to residues and other unsuitable materials that will require off-site disposal, the MRC and Fiberight have planned for the disposal of MSW bypass waste expected to be generated during scheduled and unscheduled facility downtimes or for other unforeseen circumstances when the facility cannot accept and process MSW. Current cost estimates for portions of the development project for which Fiberight will be responsible for include site development, foundations, concrete and building construction; machinery and equipment; steel, mechanical and electrical installation; and engineering, permits and project management. Total estimated capital costs for which Fiberight is responsible for is $66,976,786. Fiberight will also be responsible for the following estimated expenditures: annual operational costs; annual maintenance costs; and facility closure costs for a total cost of $12,700,000. Fiberight has provided a letter of “Intent to Fund”, dated December 18, 2015, from Covanta Energy, LLC (“Covanta”) stating that Covanta is engaged with Fiberight to support the development, financing, construction and operation of the proposed processing facility. Covanta conducted a review of financial projections related to the project and executed a term sheet for a long-term strategic partnership with Fiberight. Covanta has reviewed the estimated budget for the proposed project, totaling approximately $67 million, and confirmed their interest in supporting Fiberight with project finance in the form of an equity investment in the proposed processing facility. In part, both Fulcrum and Fiberight discovered that their projects could be compared to infrastructure projects financed by tax-exempt municipal bonds — and both have found their key debt component via that route. Private Equity was provided by a firm specializing in sustainable infrastructure investments. The firm targets mid and smaller sized opportunities in waste, energy, water and agriculture. The target developer offers projects with unique competitive advantages, replicable and scalable project types and strong customer relationships. Covanta’s letter is not intended to be a binding commitment to provide financing. A binding financial commitment is subject to successful completion of due diligence activities; including, but not limited to, the proposed project receiving relevant Federal, State and local permits, and Fiberight entering into acceptable waste supply agreements with the MRC and its charter communities. Covanta’s role in the proposed processing facility will be as an investor and operator. Covanta has supplied adequate evidence of its ability to fund the construction and operation of the proposed processing facility; however, the ultimate level of investment is still under consideration by Covanta. The intent is for Fiberight and Covanta to be joint investors in the proposed project. Letters of “Intent to Fund” were also provided by DTE Energy (dated June 11, 2015) and Argonaut Private Equity (dated June 17, 2015). In the event that either DTE Energy or Argonaut Private Equity is utilized for funding, their involvement with the proposed project will be in the form of project financing only, acting as a financial institution. Plastic and metal residues are recovered. In September 2009, Fiberight purchased a shuttered former 5.6 Mgy dry-mill corn ethanol plant in Blairstown, IA from Global Energy Holdings with the intent to cost efficiently retrofit this plant for commercial level operations. Initial stage investment for the company’s $30 million Iowa plant will enable the company to commence the production of cellulosic ethanol and/or biogas using industrial and municipal solid wastes with proprietary sorting, pulping, enzymatic hydrolysis and recycling technology. In 2015, after seven years of research and development, including 3,500 hours of continuous operation at a fully-integrated plant in Virginia, Fiberight said it would switch gears and rather than build a garbage-to-ethanol facility at a mothballed ethanol plant in Blairsville, the company aimed instead to produce biogas for CNG from the garbage. But the pivot dates in many ways back to August 2013, when Marion, IA approved a $20M solid waste to compressed biogas facility operated by Fiberight. The company, which was backed by a $25M loan guarantee from the USDA, a $2.9M grant from the Iowa Power Fund, and $20M in private investment, is scaling up from its currently operating demonstration facility in Virginia. The plant will sort up to 400 tons of garbage each day, and leftover waste will be sent to a shuttered ethanol plant in Blairstown, which Fiberight has recently purchased and is in the process of upgrading. The Iowa plant must be open and running by January 1, 2015, or else Marion may void the agreement. In December 2013, Iowa City said it was looking for permission to start negotiations with Fiberight to set up MSW-to-ethanol production, much in the way Marion has already done. The City held an RFP earlier this year and Fiberight was the only company to respond. 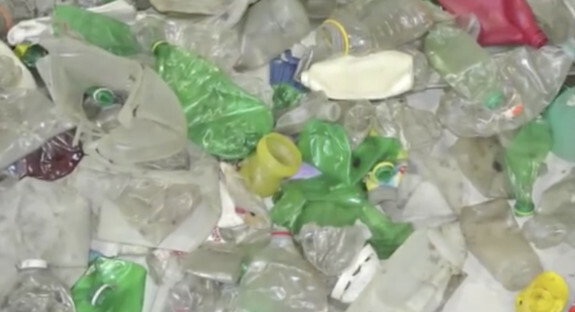 The company said it could reduce the amount of waste going into the landfill by 80%. In October 2014 we reported that the University of Maine had been hired by a consortium of 187 towns and their MSW streams to evaluate whether Fiberight’s technology could be a good option for the state’s waste. 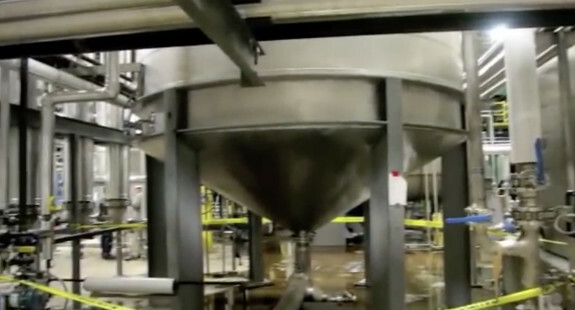 Fiberight was producing its Trashanol at a facility in Lawrenceville, Virginia. Currently the consortium’s waste is processed by a waste-to-energy plant in Orrington it partially owns but will not likely be profitable after 2018 when its current power offtake agreement expires. In December 2014, plans to develop a $40 million to $80 million Fiberight waste-to-energy plant in Hampden took its first official baby steps when developers from the Municipal Review Community that represents the solid waste for 190 towns in the state put forward the project for review by the Hampden Town Council. City planners as well as state authorities need to sign off on the plan in order to implement it. In July 2016 we reported that Fiberight received the final permits from the Department of Environmental Protection for its proposed MSW-to-fuel plant in Hampden where it plans to process the waste from 100 communities in the state. Those opposed to the project called for a public hearing on the project but the calls came nearly a year after the deadline and the reasons for the hearing provided weren’t deemed strong enough in any case to provoke a hearing. Fiberight and the Municipal Review Committee promoting the project must submit funding details for the project within 30 days for the permits to be finalized. The Hampden MRC manages the affairs and concerns of their current 187 municipal members. The member-led MRC has successfully managed the current 30-year contract with the Penobscot Energy Recovery Corporation waste-to- energy facility, located in Orrington, Maine, since 1991. The MRC, on behalf of the Equity Charter Municipalities, purchased and manages a 23% ownership interest in the PERC facility. As part of this function, the MRC conducts the following: monitors the PERC facility’s performance; reviews and votes on the facility’s annual operating budget and decisions to invest in capital and major maintenance projects; and oversees actions taken and investments made to the PERC facility to ensure that potential environmental impacts are avoided and mitigated appropriately. CES, Inc. is an environmental consulting firm, with its headquarters located in Brewer, Maine, with experience in preparing applications for submittal to the Department. CES provided personnel to assist with permit application preparation, site investigation and site design for the proposed project. CES has also been retained by the MRC and Fiberight to provide on-going environmental compliance assistance when needed. Amec Foster Wheeler is a British multinational consulting, engineering and product management company with its global headquarters in London, England and branch offices worldwide and in the United States, including Portland, Maine. AMECFW has been retained to provide construction management services including contract scoping and preparation of contract packages, construction scheduling, project cost control, risk identification and management, quality assurance, contractor and construction site monitoring and on-site safety monitoring. CommonWealth Resource Management Corporation is a management and environmental consulting firm focusing on issues and opportunities related to resource conservation, recovery and utilization. CRMC has been retained for general assistance related to the design, construction, operation and maintenance of the proposed processing facility. The University of Maine is a public research university with a focus on undergraduate and graduate research throughout Maine and around the world. UMaine Chemical Engineering professors have been retained to perform a peer review of the technological processes associated with the proposed processing facility. Cianbro is one of the United States’ largest, most diverse, successful, open shop, 100% employee-owned construction and construction services companies. Presently operating in more than 40 states, 5 markets, and employing over 4,000 team members, Cianbro manages and self-performs civil, structural, mechanical, electrical, instrumentation, fabrication, and coating. 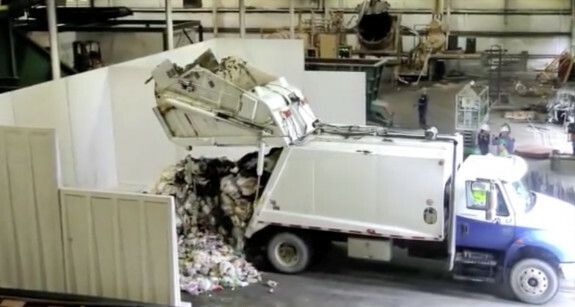 Materials Recovery Facility (MRF): The first stage in the process (primary MRF) is to remove large bulky items prior to the MSW being loaded into a low torque shredder which opens and empties the bags of trash. Unwanted large bulky items will be loaded on a trailer and transferred for disposal at a licensed landfill facility. The MSW is then conveyed through a series of screens to create different sized fractions. Materials 2 inches or less in size continue through to the fines processing area for further processing. Materials larger than 14 inches continue on to be hand sorted for recycling or disposal. The remaining sorted material, along with recovered material from the fines processing area, is conveyed into a drum pulper that breaks the organic material down to form a biomass and allows for removal of any fine contamination, the recovery of soluble organics and resulting cellulosic pulp. Pulped material passes across a screen to recover recyclables, such as metals and plastics. The remaining biomass is conveyed to a washing system to remove fine contaminants (mostly plastics) and soluble organic material. The homogeneous organic fiber is conveyed into a two-stage continuous washing process that further screens contaminants and separates the organic fraction. The first-stage wash removes soluble organic material and pumps the high chemical oxygen demand wastewater to a pre-acidification tank prior to entering the high-rate anaerobic digester for biogas production. The second-stage wash dilutes the remaining material where filters are used to separate out the fine cellulose from the remaining contaminants. The washed cellulose is then pumped into a stock tank. From the stock tank, the cellulose pulp is pumped as slurry into a screw press where it is de-watered to approximately a 50% solids press cake. Washed fibers exit the system and are pumped to be pre-treated for hydrolysis. Renewable Fuel Production: The enzymatic hydrolysis stage starts when the dewatered pulp is conveyed to the pretreatment reactor whereby water and acid is added into a pretreatment mixer so the appropriate solids concentration and pH is obtained. Slurry from the pretreatment mixer is then pumped to the pretreatment reactor. Fiber exiting the pretreatment reactor is pumped to a medium consistency refiner and then to a screw press to be dewatered, filtrate is returned to the mix tank. The pretreated fiber press cake is conveyed to an enzymatic hydrolysis digester. 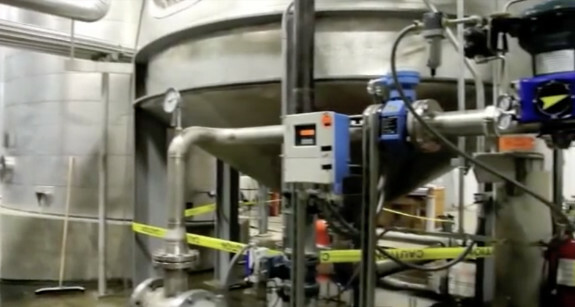 The pretreatment reactor, pumps, filtrate tank and screw press are connected to a Clean-in-Place system for regular cleaning and sterilization. The hydrolysis process is carried out within a high viscosity digester paired with a set of mixing tanks. The pretreated fibers enter the mixing tanks along with water and enzymes. The wetted fibers circulate through the hydrolysis tank where cellulose within the fiber is converted to sugars on a batch basis. Temperature and pH are controlled to achieve an optimum mixture which is left in the digester where the low-temperature biological process is complete. Each digester, pump, heat exchanger and mixing vessel is connected to a CIP system for regular cleaning and sterilization. A filter press is utilized to separate the undigested solids from the liquid sugar solution. The undigested solids are slurried and passed to the water treatment plant. The sugar solution is pumped to an evaporator where it is concentrated for storage to be shipped and sold as industrial sugar or will be fed to the anaerobic digester for conversion into biogas. The condensate recovered from the evaporator is stored and used as make-up water for the digestion process. Renewable Energy Production: The renewable energy production stage begins when the high organically loaded liquid is cooled and sent to an anaerobic digestion system. This system uses microorganisms to digest suspended and dissolved solids contained in the water to reduce the chemical oxygen demand of the water. Clean water and a methane-rich biogas are the byproducts of the stage. The clean water is reused in the washing process. The biogas will be used as supplementary fuel for internal energy production via a boiler and injected into a natural gas pipeline. Bangor Natural Gas has provided a February 10, 2016 letter stating that a section of pipe between Bangor and Hampden needs to be upgraded and that upgrades including testing will be completed prior to facility start-up. Process water recovered from the water treatment system is used to dilute solids in the pulp and wash systems to maintain desired moisture content. A portion of the recovered water is sent to the CIP storage tank. The solids from the water treatment plant, which is spent fiber with a high lignin content, are processed in a specially designed combustion unit. The heat (steam) from the combustion process is recovered and sent to a steam turbine. The exhaust heat from the turbine is then used to provide process heat. The amount of electrical and heat energy generated by the biomass combustion is sufficient to provide the energy demand for the proposed processing facility. The proposal to produce fuel grade ethanol is no longer part of the proposed processing facility project. Plant water management is conducted via a recycling and reuse system. Purge water from the washing system, diluted solids from the sugar recovery and stillage from distillation are blended together. The solids are removed using a belt press and any residual fine suspended material is removed using a dissolved air flotation system. The highly organic liquid created is sent to the anaerobic digester. The solids, in the form of cake, are sent to the biomass boiler. Industrial Co-products: The resultant products generated at the proposed processing facility will include recyclables which will be sold on the open commodities market; post hydrolysis solids which will be used to fuel the on-site biomass boilers; bio-methane which will be piped to the adjacent Bangor Natural Gas Loring Pipeline; and biomass fuel (industrial sugar) which may be sold on the open commodities market depending on contractual, market, and operational conditions. The resultant residue waste products generated at the processing facility will include materials typically 2 inches or less in size (glass and grit), large bulky items, dissolved air filtration system residues and combined boiler ash. The Fiberight data and feedback does suggest that their technology can convert the organic portion of the MSW into two sugar rich streams. The first is a C5 rich stream, which is liquid and goes to an AD where it is converted into Biogas. The second stream is a cellulose rich stream that is deconstructed to a C6 rich sugar stream. This C6 rich stream is the stream we focus on here. Based on feedback from Fiberight, effective yield is very low probably due to low enzymatic conversion of cellulose/hemicellulose to sugars. This is an area that will need significant improvement, as enzyme cost will be the major cost component in conversion to sugar. Fiberight data on conversion of MSW derived sugar conversion to ethanol was much lower than both woody biomass derived sugars and corn dextrose. This suggests that a high level of inhibitors may be present in the MSW sugar that may diminish ethanol conversion efficiency. Scale up concerns could be caused by these inhibitors (possible contamination) in the MSW sugar fermentation. Fermentation stability could be jeopardized. One thought to minimize this risk should be to complete systematic pilot scale testing utilizing MSW derived sugars to produce ethanol, possibly have smaller fermenters, aggressive CIP systems and aggressive SOP’s to counter the potential contamination. A Greenfield site for this type of process will be a major challenge. The need for MSW receiving, sorting, organic cooking, organic solid/liquid separation, liquid C5 rich conversion to biogas via AD and conversion of the solid organic stream to C6 rich sugar to ethanol is a complicated process requiring an energy platform, water intake, water treatment and all supporting equipment and systems. To simplify the process, one option to consider is eliminating the sugar conversion to ethanol portion of the overall process and forward all liquid sugar to the AD. This would reduce a major portion of capital outlay and may be more efficient overall. The complete review and a host of supporting documentation, site visit reports and more is available here. Let’s not overlook the cautionary notes. But nor should we overlook that the pivot to a new fuel and a new financing structure built around traditional tax-exempt municipal bonds long used for local infrastructure projects — those are two elements that Fulcrum BioEnergy and Fiberight have in common — and now, they’re both financed with their first commercials.